Ah, summertime! After the longest winter ever recorded (in my mind, at least) we’re finally seeing some sunshine, warm temperatures, and most importantly of all some fresh produce. I’ve been taking full advantage of the plethora of leafy greens, juicy berries, and every other edible plant I can get my hands on. You might think this would mean you’d be seeing more blog posts detailing all of the fun things I’ve been doing with strawberries and spinach. Unfortunately, you would be wrong in that assumption, as summertime also means much more time spent at work and very limited free time. As much as I’d love to have a little more leisure time at my disposal, my summer schedule does force me to prioritize and to be much more efficient in order to squeeze in everything I want/need to accomplish during my day. And after too many slothful winter days spent curled up under a blanket, being uber-productive for awhile feels pretty good. Cooking this time of year definitely becomes an exercise in efficiency, partly due to lack of time but due just as much to the fact that I’d prefer to keep my time spent over a hot stove to a minimum. I’ll be the first to admit that efficient cooking can be a little boring, as it often results in us falling back on old standbys and eating the same thing week after week. But it can also be a nice little reminder that garden-fresh food tastes so good just the way it is, and we needn’t spend a lot of time and energy cooking the life out of it to make it taste like something else. Instead, we can showcase these already perfect ingredients, balancing their simple flavors and textures into something even greater than the sum of its parts. And we don’t have to spend much time doing it. For me, this mango and avocado salad is just such a thing, and it’s for that very reason that it’s been in heavy rotation around here lately. Creamy avocado barely coats the juicy chunks of mango and crunchy shallots. Cilantro adds a bright, herbal flavor and the whole thing comes together with a spicy-sweet-tart dressing. This is great as a side dish to any mexican meal, piled on a tostada, or served over greens for a light lunch. 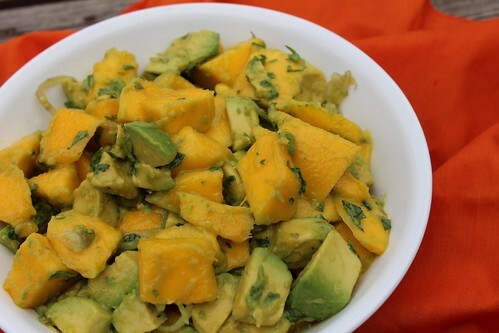 You could even cut up the avocado and mango into smaller chunks and eat it as a salsa with tortilla chips. Lots of options for a very quick and easy dish using some of my favorite seasonal produce. 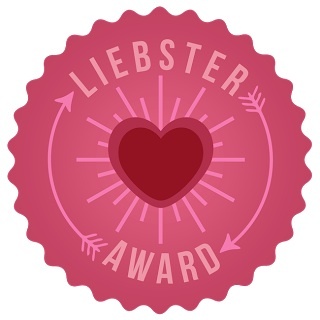 Before I share this super simple recipe, I’d like to send a huge thank you to Lilly Sue over at Lilly Sue’s Bites and Brews for nominating me for a Liebster Award! It’s always such a wonderful feeling to get a little love and recognition from your peers. This encouragement couldn’t have come at a better time since life has been getting so crazy these days that I’m having trouble finding the time to actually cook our meals, let alone blog about them! Below I’ve listed my own nominees and the award guidelines. Thank you Lilly Sue for the award, and thank you to my nominees for the inspiration. 1. Thank and link to the blogger who gave you the award. 2. Copy and paste the award in your post. 3. Pick 5 other blogs with less than 200 followers to award. Leave a comment on their blog to let them know about their nominations. Mashing the serrano into a paste, rather than using the whole minced pieces, spreads the spiciness throughout the salad. I think we can all agree this is a much more enjoyable experience than getting that surprise bite of hot pepper when you’re least expecting it. First, prepare the dressing. 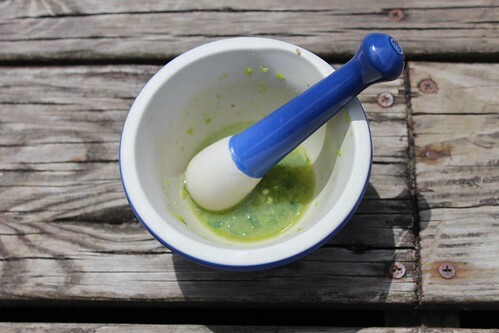 Using a mortar and pestle (or a small bowl and a fork), smash the serrano pepper and salt until a juicy paste forms. Add the lime juice and agave nectar and stir to combine. Taste and adjust the sweet/sour balance if necessary by adding a little more agave or lime juice. Set aside. Put the mango cubes, shallot slices, and cilantro in a large bowl. Pour the dressing over top and stir well to coat all of the ingredients. Add the avocado cubes and gently toss until everything is evenly distributed. Serve immediately.